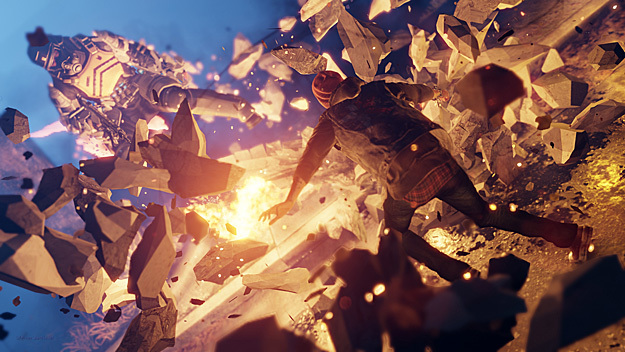 inFAMOUS: Second Son isn’t an exact sequel to the previous games but more of another chapter set in the same world. The story takes place years after the first two games and its story is influenced by the events of these games. The biggest influence comes in the form of the Department of Unified Protection, which has been established to make sure that nothing else happens like what transpired in the first game. In case you can’t tell, they’re going to cause a lot of problems for you during the game. The primary revelation we were told about inFAMOUS: Second Son is that contrary to how the trailers have sold the game, the main character’s powers aren’t specifically fire/smoke powers. The game’s main character, Delsin Rowe, actually has the ability to absorb the powers of other super humans, and the first time he discovers this is when he takes the powers from someone with the fire/smoke abilities. Instead of setting its events in another fictional big city, developer Sucker Punch have chosen their hometown of Seattle for the location of the new game. Unlike games such as Watch_Dogs, which is recreation of Chicago, inFAMOUS: Second Son was described as being their version of the city instead of a carbon copy of it. By that they mean that famous locations from the city will be seen around the map but may feature a little spin on them since they’re not set in this fictional world. In terms of gameplay, Second Son doesn’t appear much different from the previous installments, even though the main character finds himself blessed with a different set of powers than Cole MacGrath. What is different about his abilities and the play style is in how he can manipulate the environment around him for his powers. Rowe is capable of propelling himself through the air, not exactly flying, by pushing down with his arms totally covered in flames (like he has rocket arms). Another new way he transfers his powers is through the chains he wears on his wrists. In addition, he can change into a sort of smoke form to move through fences and travel through air vents in buildings. Delsin is also capable of shooting fireballs, as you’d expect, but those don’t appear to be his main source of attack which is a welcome surprise. Fans of the previous “inFAMOUS” games will likely find enjoyment in this new title. It has enough of a new spin on the idea and a new location to give players a reason to look into it and it doesn’t appear to hinge itself totally on the previous games’ story so newcomers are welcome. It has impressive visuals and some interesting ideas to go along with it. inFAMOUS: Second Son will be released exclusively on the PlayStation 4 in the first quarter of 2014.